QuickTax, online at QuickTax.Intuit.ca, is a fantastic product to help you with your tax return. QuickTax Standard is the best tax software for you if your return will include donations, medical expenses, RRSPs or even tuition - and if you want to optimize deductions between spouses and family members. Plus, file online with NETFILE1 to get your refund in only 8 business days! Just be sure to take a second to stop by 58Coupons.com to save with the latest QuickTax coupons, QuickTax discount codes, and QuickTax promotions! The QuickTax Free Online Edition is ideal for Canadians with very simple tax situations. Click link to see if you qualify for this great deal. As a student you qualify for free use of the QuickTax Student Online Edition, ideal for college and university students with tuition fees for the 2009 tax year. Click link to enjoy this great deal from QuickTax. The QuickTax Standard Online Edition for the 2009 Tax Year includes 1 return and only costs $19.99. Click link to get started on your taxes today. 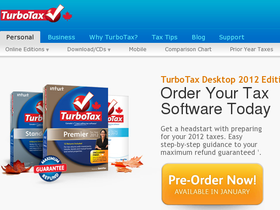 If you buy QuickTax Standard for the 2009 Tax Year on CD or for download you can complete up to 8 returns for only $40. Click link to get started. Get started on your taxes today using QuickTax Standard Online Edition for the 2009 Tax Year and try it for only $19.99 from QuickTax.Intuit.ca. Click link.